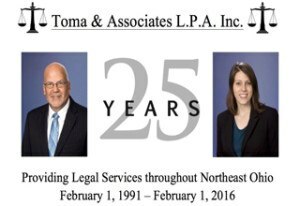 Toma & Associates L.P.A. began in 1991 as a law practice, dedicated to serving the legal needs of businesses, individuals, and families in the greater Cleveland area. We are proud to have served those needs for 25 years. Attorney Timothy Toma, his associated attorneys, and dedicated staff are committed to providing quality service in a timely manner, for a reasonable fee. Fee arrangements may be fixed, contingent, or hourly, depending on the nature of the matter and the particular needs of the client. At Toma & Associates, we focus on helping you collect delinquent and past due debts or accounts. We also assist in handling a variety of other litigation matters. We can also help you set up wills, powers of attorney, or trusts to implement an estate plan. We assist property owners and tenants in negotiating and reviewing leases or, when necessary, handling evictions. As a former law director in the City of Maple Heights, Timothy Toma also assists other municipalities in the greater Cleveland area as outside counsel. Our offices are conveniently located in Willoughby Hills, with easy access to I-90 and I-271. We appear in court and represent clients throughout the greater Cleveland area, including Cuyahoga, Lake, Geauga, Summit, and surrounding counties. Toma & Associates, L.P.A., Inc. is located in Willoughby Hills, OH and serves clients in and around Willoughby, Eastlake, Mentor, Wickliffe, Chesterland, Grand River, Gates Mills, Euclid, Cuyahoga County, Geauga County and Lake County.